In January the Bainbridge Public Library will again sponsor its Great Decisions series: 8 lively discussions on the most important foreign policy issues facing the US today. 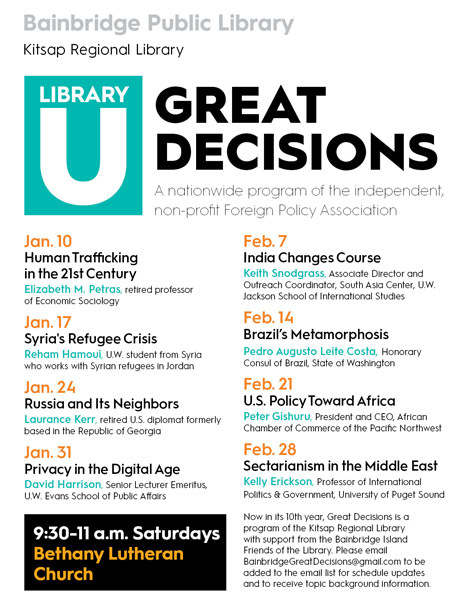 Now in its tenth year, Great Decisions at the Library is part of a nationwide, non-partisan program of the Foreign Policy Association intended to broaden public involvement in foreign affairs. This year’s topics will be: Human Trafficking in the 21st Century, Russia and its Neighbors, Privacy in the Digital Age, Sectarianism in the Middle East, India Changes Course, U.S. Policy toward Africa, Syria’s Refugee Crisis, and Brazil’s Metamorphosis. While enjoying coffee and pastries, participants first view a 30-minute Foreign Policy Association DVD on the topic under consideration and then engage in a discussion led by an informed moderator. A Briefing Book, published by the FPA, is also available. This year’s series will begin with Human Trafficking in the 21st Century on Saturday, January 10 from 9:30-11a.m. at the Bethany Lutheran Church Fellowship Hall. The moderator for this discussion will be Elizabeth M. Petras, retired professor of Economic Sociology. To be added to the mailing list for suggested background readings on the topics and other information about Great Decisions at the Library, email GreatDecisionsBainbridge@gmail.com . 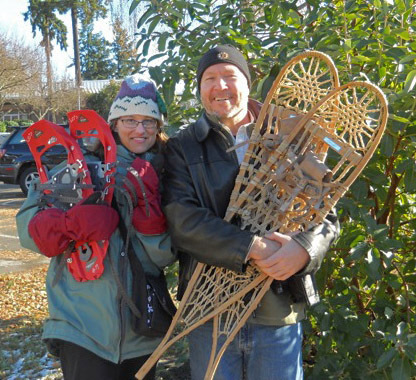 The library’s Tressa Johnson and John Fossett, featured in this interview, prepare for Snowshoeing With Jeff! Also on offer through the library starting in January is a new series called “What Do You Know,” which features knowledge explorations led by community experts from Parks & Rec, the Historical Society, Squeaky Wheels, and the Battle Point Astronomy Association. The inaugural program, entitled “Snowshoeing with Jeff,” will feature Jeff Ozimek, Outside Programs Manager for Bainbridge Island Parks & Recreation Department. He’ll offer a how-to presentation on snowshoeing, including where to go, what to do, and what you’ll need to enjoy the wilderness. The library will be providing training sessions for tablet and ebook users: tablet users can call to schedule an hour of one-on-one training, and for ebook users there will be two separate presentations, each followed by hands-on time. Ebook sessions will be offered Saturday Jan 3 from 10am-12pm and Tuesday Jan. 13 from 1-3pm. So come on down and enjoy the fun: you’ll be glad you did! Credits: BCB host and audio tech: Joanna Pyle; BCB audio editor: Jon Cooney; BCB social media publisher: Diane Walker.